Eye On Sports Media: Should Anyone Pay for Sports Illustrated Anymore? Should Anyone Pay for Sports Illustrated Anymore? Athens, GA (Sept 17, 2008) - Forbes Magazine is dead! It has lost its relevance and necessity in the information age. For many reasons it feels good to say that, but you would have to be a member of the IBM Lotus Software community to get the irony of the statement (and no it is not really dead. It is being used as a metaphor for magazines in general). But last week as I sat going through the annual ritual of renewing subscriptions to print magazines for my the annual fund-raising drive put on by my daughters' school, I seriously wondered what print magazines were worth subscribing to. The first to be axed was U.S. News and World Report because it has recently ceased to be a weekly publication, cutting back to a bi-weekly schedule. Two week old news is not news. The magazine is no longer relevant because of that. Time Magazine and National Geographic got renewed because it is still weekly and I like to hold some magazines in my hand. As I thumbed through the catalog, I came to the ad for Sports Illustrated and chuckled. $20 for 28 issues or $39 for 84? And no swimsuit issue? The fingers tapped as I wondered if it was worth the price. Then a light bulb went off. I can get all of the content of the current issue online at the free SI Vault web site that was launched earlier this year. Well, almost all of the content. The articles do not include any of the pictures. 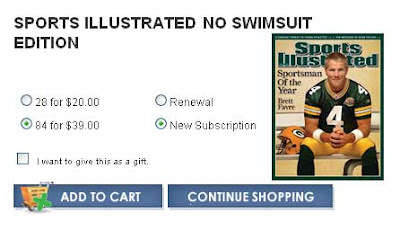 But if I really wanted to, the galleries of all the swimsuit issues since 1996 are on the si.com site for free, as well as all of the covers since 1964. I can get all of the content I could possibly want, sans pictures that go along with current stories, for free. So why would I, or anyone even pay for a print subscription in this day and age. Well, since my kids have been known to call me the "Thriftinator" from time to time, I cannot see dropping a dime to pay. The question is, should anybody really pay for a print subscription to Sports Illustrated anymore? From a 10,000 foot view, we know that Sports Illustrated has to pay the bills somehow, and if subscriptions drop, so does print advertising revenue. The money will have to come from somewhere, like the web sites. But how? And more importantly, how long will this great resource continue to be free? Remember a time when all of the content on ESPN.com was free? Will the SI Vault become an April Fool's tease for readers down the road? With the trade off of seeing content online vs. paying for a print subscription, I am left to wonder if Sports Illustrated is going to drop this hammer anytime soon. If they do not, it is not clear how they will stay sustainable and relevant much longer if print subscriptions drop. Then again, a lot of readers like the print edition for the pictures as well. Oh and in case your were wondering, you CAN also get a subscription WITH the swimsuit issue on that site. They just give parents an option.